Helen O'Grady Drama - We made play dough shapes with our bodies and went on a magic carpet ride to Dinosaur Land! We had a visit from Jacquie, who is a guide dog trainer and her dog Iris. Road Safety - We have been learning how to keep safe by the roads. We sang a song to remind us to 'Stop, Look and Listen' and did some role play to practise crossing the road in the hall. On Friday we made traffic light pizza! Thank you to Miss Lynda who came into nursery to teach us some dancing. We had a great time! In our first session with AJ and Gail we warmed up with a game of Foxes and Chickens. The foxes had to run really quickly to chase the chickens and take their tails. 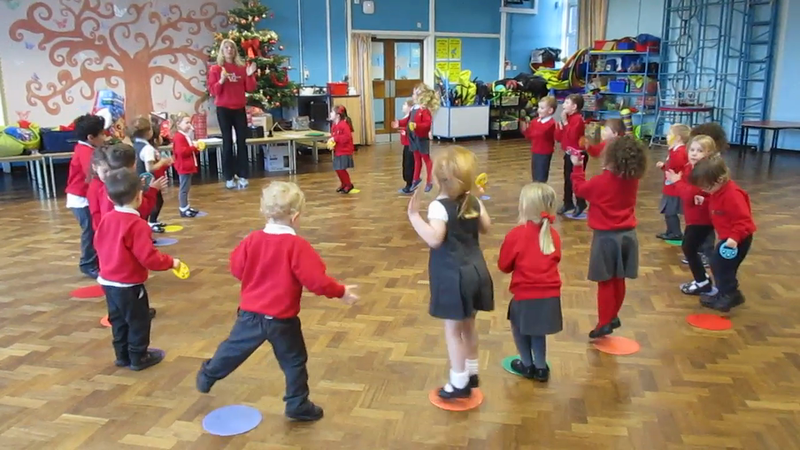 We then tried to control the ball with our feet doing the Penguin and Bear dribble. We then practised the dribbling skills during a game where we had to collect the treasure for our pirate ship. When AJ shouted 'stop' we had to show the Footballer's pose! This half term we have been helping Little Miss Magic to tidy her bedroom, learning about our quad and trapezius muscles and bouncing the Little Miss and Mr Men soft toys on the parachute.